Have you ever wished you had the time and tools to organize your house in a clutter-free, design-conscious, Pinterest-worthy way? 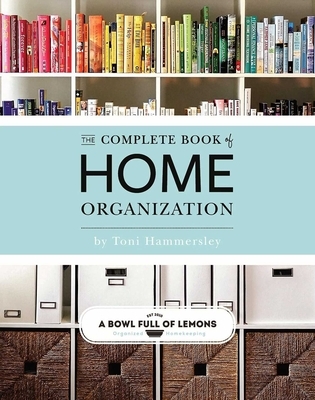 From storage solutions and cleaning tips to secret space-saving methods and expert strategies, The Complete Book of Home Organization is packed with the tips and shortcuts you need to effectively organize your home. From small spaces and apartment solutions to how to tackle a big, messy home with a 15-week total home organization challenge, this book covers it all. The Complete Book of Home Organization spells out everything you need to de-clutter your house, store your belongings, and keep your home—and life—in tip-top shape. With high-quality design, intricate detail, and a durable flexicover—this manual is the perfect gift! Organize the 30 main spaces of your home, including the living and dining spaces, bedrooms and bathrooms, guest areas, baby and kids’ rooms, utility spaces and garages, entryways and offices, patios and decks, closets and pet areas! Keep track of your pantry, holiday and craft supplies, weekly menu planning, keepsakes, and schedules. From the basement to the attic, this book covers every nook and cranny. With step-by-step instructions, detailed illustrations, and handy checklists, say goodbye to a messy home and wasted storage space! Toni Hammersley is the creator and writer of www.abowlfulloflemons.net, an organizing website that inspires thousands of people around the world to get their lives in order. She hosts a popular 14-week organizing challenge each year, aimed at helping others conquer clutter. She is also a registered nurse and photographer. She lives in Charleston, South Carolina with her husband and three children.